We take you through beautiful natural landscapes of Herzegovina's mountains, from their green valleys all the way to their highest peaks. Choose a hiking tour with us and start an adventure that you will remember for life. 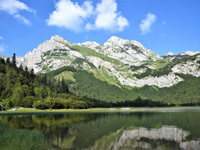 Prenj Mountain, widely considered one of Bosnia and Herzegovina’s most beautiful mountains, is a true heaven for hikers. This 2 day hike will take you through the beautiful natural landscape to the highest peak of Prenj, Zelena glava. Hiking tour with ascent over 1000m and with over 6 hours of walking in one direction with occasional demanding terrain that could include rock climbing down secured trail. 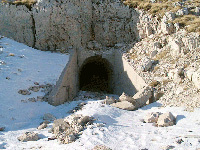 Čabulja Mountain is situated 20 km north-west from Mostar. Even though it doesn’t have the height of other mountains in Herzegovina it still offers breathtaking views. 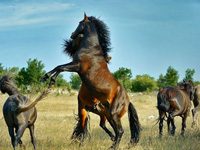 With this hike, we will climb the highest peak of Čabulja and visit the territory of wild horses. Hiking tour with ascent from 500 to 1000m and with 3 to 5 hours of hiking with possible small demanding terrain parts. 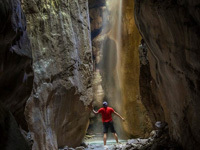 Canyon of river “Bijela” is situated 20 km north of Mostar. The river springs underneath mountain Prenj and runs down for 5-6 km through beautiful intact nature. Hiking path is taking us close by the river where you can taste its fresh and icy water. Hiking tour with ascent up to 500m and with 2 to 3 hours of walking without demanding terrain that would include rock climbing. Maglić Mountain is the highest mountain in Bosnia and Herzegovina, 2386m high and situated on the border with Montenegro. 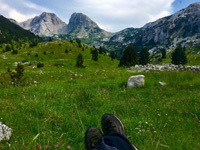 On our hike tour, we will climb the highest peak of Maglić and visit National Park Sutjeska. Čvrsnica Mountain, as a part of mountains representing Dinaric extension of the Swiss Alps, is located in northern Herzegovina. This hike leads us through endemic Munika Pine woods of Čvrsnica Mountain to our destination, Hajducka Vrata. Nature Park Blidinje includes territories of Čvrsnica and Vran Mountains and it spreads through 358km2. Our tour includes easy mountain walk through beautiful, fragrant natural forest and a visit to rural households with domestic products tasting. Velež Mountain,named after the Slavic god Veles, is a mountain located in the south-central part of the Herzegovina region and overlooking the largest regional city of Mostar. 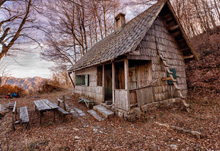 Climb Velež Mountain and visit former Yugoslav army underground shelter. Čvrsnica Mountain, as a part of mountains representing Dinaric extension of the Swiss Alps, is located in northern Herzegovina. 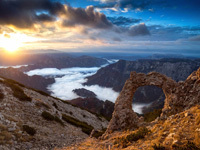 It has more than ten summits above 2000 m. Its highest peak – Pločno (2228masl) is actually the highest mountain peak in all Herzegovina and bears the name „Herzegovina’s roof top”. Čvrsnica also hides beautiful lakes: Blidinje, Crepulja and Crvenjak. Its bio-life is characteristic with numerous endemic species (like Munika Pine) and is also known as a home of chamois. 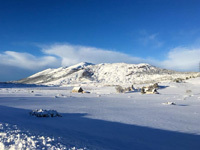 We find it as the ideal place for all those who desire silence, wilderness and mountain peacefulness, complemented only with sounds of wind and hidden forest inhabitants. We were group of four and took a tour with Miroslav to Velez mountain. From Brasina peak we enjoyed wonderful views of whole Herzegovina and even catched a glimpse of Mediterranean sea in the distance. This was a highlight of our trip to Bosnia and Herzegovina.